We had our first river cruise in 2017, a Viking Rhine cruise, and were so impressed with the way Viking looks after you from the moment you arrive, to the moment you leave. 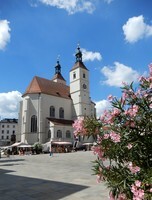 We returned this year for their Romantic Danube cruise. We were a little apprehensive as last year we were on the Viking Hild, which at that time was only about 3 weeks old. So we were not sure whether the Viking Var would compare favorably, being a little older. Glad to report that this longboat was just as perfect. 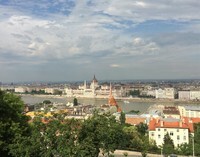 We opted for the pre-cruise 2 nights in Budapest and are so glad we did. We were unlucky enough to get the only wet day of our trip, but despite this, our tour guide managed to make our 5 hour walking tour - a Taste of Budapest - so much fun and very interesting. Without her, there we would not have seen much of Budapest at all, in fact the rain would have probably driven us back into the hotel. She had tickets already for the Parliament tour, and when we got there the lines were almost out the door for people trying to get tickets (it being a rainy day), so we most likely could not have done this on our own. She showed us parts of Budapest we would not have found, including a restaurant with its own museum downstairs. On board, the Viking crew were excellent, with our Program Director, George being a real star. This position is vital to everyone having a good time, and George did exactly that, with a great sense of humor and endless energy. The onboard meals could not be faulted, and we enjoyed the white cloth, and waiter service with plenty of choices. We also appreciate the self service station, where you can make a variety of drinks 24 hours a day, including cappuccinos, hot chocolate, flat or sparkling water, and a variety of teas, even chamomile. The continuous supply of bottled water in the cabins is another great convenience, and being handed a bottle of drinking water each every time we left the boat for an excursion. Really there is nothing that Viking has not thought of to make the vacation really special. The evening port talks, to give you information for the following day&apos;s excursion, were really helpful, as were the printed sheets placed in our cabins during dinner each evening. All the excursions were very enjoyable, with Regensburg being our favorite, as our guide there kept us walking and talking, and not wasting time standing around too much. But all the places were visited were excellent. Needless to say, we have already booked for 2019, for their Rhone river cruise. We had our first river cruise in 2017, a Viking Rhine cruise, and were so impressed with the way Viking looks after you from the moment you arrive, to the moment you leave. We returned this year for their Romantic Danube cruise. We were a little apprehensive as last year we were on the Viking Hild, which at that time was only about 3 weeks old. So we were not sure whether the Viking Var would compare favorably, being a little older. Glad to report that this longboat was just as perfect. We opted for the pre-cruise 2 nights in Budapest and are so glad we did. We were unlucky enough to get the only wet day of our trip, but despite this, our tour guide managed to make our 5 hour walking tour - a Taste of Budapest - so much fun and very interesting. Without her, there we would not have seen much of Budapest at all, in fact the rain would have probably driven us back into the hotel. She had tickets already for the Parliament tour, and when we got there the lines were almost out the door for people trying to get tickets (it being a rainy day), so we most likely could not have done this on our own. She showed us parts of Budapest we would not have found, including a restaurant with its own museum downstairs. On board, the Viking crew were excellent, with our Program Director, George being a real star. This position is vital to everyone having a good time, and George did exactly that, with a great sense of humor and endless energy. The onboard meals could not be faulted, and we enjoyed the white cloth, and waiter service with plenty of choices. We also appreciate the self service station, where you can make a variety of drinks 24 hours a day, including cappuccinos, hot chocolate, flat or sparkling water, and a variety of teas, even chamomile. The continuous supply of bottled water in the cabins is another great convenience, and being handed a bottle of drinking water each every time we left the boat for an excursion. Really there is nothing that Viking has not thought of to make the vacation really special. The evening port talks, to give you information for the following day&apos;s excursion, were really helpful, as were the printed sheets placed in our cabins during dinner each evening. 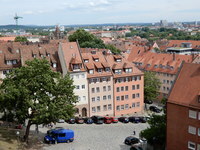 All the excursions were very enjoyable, with Regensburg being our favorite, as our guide there kept us walking and talking, and not wasting time standing around too much. But all the places were visited were excellent. Needless to say, we have already booked for 2019, for their Rhone river cruise. The cabin space is more than adequate, with plenty of drawer and hanging space. The bathroom is very well planned. Wet towels are constantly replaced by fresh, dry ones. Free bottles of drinking water are always in your cabin, and the throw pillows are tucked away before you retire each night, making for an uncluttered cabin. We like to have veranda cabins, as we prefer to step outside and admire the view, and to sit out there with an early coffee or tea in hand. We did not hear anything from neighboring cabins, which is a plus. Taste of Budapest with excellent, saw lots of Budapest, and enjoyed even though it was raining all the time. Had a great lunch, and a cheese roll snack. Beautiful abbey, with lots of photo opportunities. 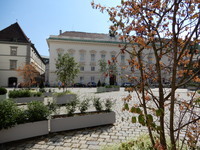 Best walking tour, with great guide, and found a lovely place to have coffee in the courtyard of the Hotel Am Dom. A great city of walking, coffee and shopping. We Loved the Entire Cruise!